In the Middle East, sumac-spiced chicken is traditionally roasted atop pita bread; my version uses fingerling potatoes instead. It's served with a heady sauce inspired by a meal I had at a Mediterranean restaurant in Bethesda, Maryland. Prep the chicken: In a small bowl, mix the sumac, paprika, salt, and pepper with the olive oil into a paste. Rub the paste all over the chicken and mix in the onion slices. Cover and marinate in the refrigerator for 8 to 12 hours. Make the sauce: Prepare the sauce a few hours before roasting the chicken. In a small saucepan, combine the oil and the garlic. Heat for 5 to 6 minutes over medium-low heat until the garlic blooms with fragrance and browns, but watch that it doesn’t burn. Let the oil mixture cool slightly and pour into a heatproof container. Remove the garlic. Whisk in the sumac, paprika, lemon juice, and honey. Season with salt and pepper to taste, and stir in the parsley. Cover and set aside at room temperature to allow the flavors to meld. 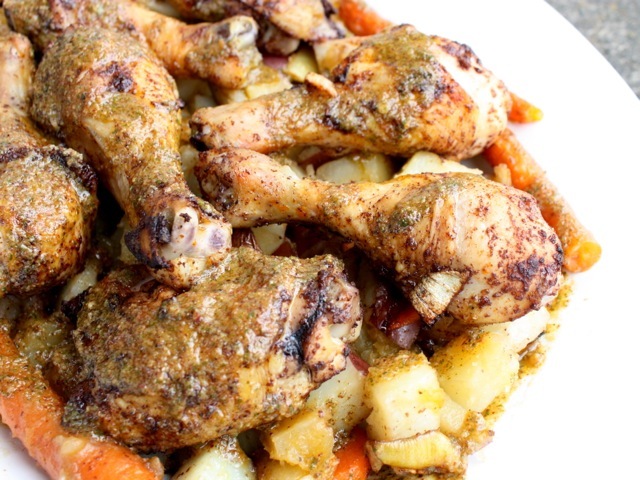 Cook the chicken and potatoes: Preheat the oven to 375 degrees. Lay the potatoes out in a roasting pan and arrange the chicken, skin side up, and the onions on top. Bake for 40 to 45 minutes, or until a meat thermometer inserted into a thigh reaches 165 degrees. Serve the dish: Serve the chicken and potatoes immediately with the sauce on the side. Stir the sauce before drizzling it on the chicken or using it as a dipping sauce. Try grilling the spice-rubbed chicken at your next barbecue, or roasting the chicken and potatoes in the roasting pan right on your grill.